February, the time for love and togetherness. What a wonderful day for a give away. 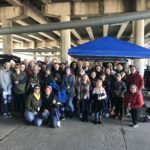 Our group of 25 volunteers handed out all the wonderful donations we collected over the last month to 114 individuals. We received a lot of feedback, and thank you’s from the people we serve and we just want to relay the message back to our donors that your kindness was very much appreciated. With the shift in seasons, we will not be handing out hats and scarves but will continue to take those donations over the summer months and store them for next winter. ATXAHH can never have enough stocks when the weather gets cold. Look out for sales at your local stores for winter items. From March until May 2016 ATXAHH will be running a men’s pants drive. We get a flurry of women’s cloths on a regular basis and during any given month the people we serve is predominately comprised of men. 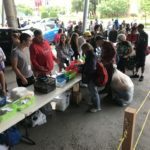 Austin Atheists Helping the Homeless is looking for community support to collect lightly worn, clean, new, or used men’s pants and belts. Here is a PDF of flyers you can print and hand out. One even has pull tabs. This would be a great project for Scouts or service hours for school. ATXAHH will happily sign off on volunteer hours for youth programs and school service hours. Click on this link: https://www.dropbox.com/s/xeg4t6tbbmh2owl/2016PDFlyer.pdf?dl=0. Beyond the Basic will be making some “Just Because” bags once again. These bags go beyond what we give out each month. Items in the bag could include; gum, soft non-perishable snacks, activity/ puzzle books, pens, note cards, gift cards to Subway, 7-Eleven, flash lights, a positive of well wishing… basically something that will lighten up someone’s day. Use paper lunch sacks and decorate them with stickers, markers, crayons… this would be a wonderful project from children to adults. 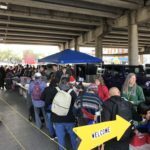 We have volunteers all over Austin and beyond to help pick up your bags, email atxahhdonations@gmail.com to arrange a pick up. Gettin’ Knotty will be returning back to washcloths. 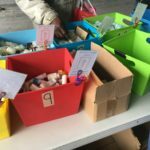 They will still collect hats, scarves, and gloves even over the summer months but their main focus will return to washcloths. Please contact Virginia Miller at atxahhknotty@gmail.com if you are interested in helping their group. They welcome knitters and crocheters alike and meet once a month at Barnes and Noble, Arboretum: 10000 Research Blvd, Austin. This month they will be meeting March 24th @ 7- 10pm in the cafe. All are welcome to come and yarn it up or just to sit and chat. You can also bring your donations and use this time for drop off right before the giveaway the following Sunday. Our next giveaway is March 27th. Have a wonderful March! ← What We Need For February 21!